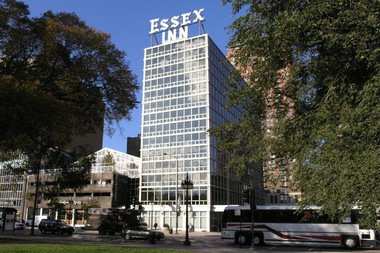 The Essex Inn might soon qualify as a Chicago landmark. CITY HALL — The Commission on Chicago Landmarks on Thursday expanded the definition of what deserves protection on the city's "front porch" on S. Michigan Avenue and immediately moved to extend that status to the Essex Inn. In what Deputy Commissioner Eleanor Gorski granted was a new preservation tactic, the panel approved a "context study" on the Historic Michigan Boulevard District. Originally granted landmark status by the City Council in 2003, the "Michigan Avenue street wall," between Randolph Street and 11th Street — often referred to as "Chicago's front porch" by architecture aficionados for its unified facade as seen from Grant Park — only protected buildings from 1880-1930. The context study, however, moved to recognize and protect mid-century modern structures built as recently as 1972, including the Borg-Warner headquarters, Johnson Publishing and the Essex Inn. The owners of the Essex, 800 S. Michigan Ave., immediately moved for landmark status to earn a tax break, and the commission unanimously endorsed preliminary landmark status without opposition, also approving the context study along the way. Ward Miller, executive director of Preservation Chicago, said his group was "in full support" of landmarking the Essex, and he also said he was "elated" that it specifically included the Essex's distinctive rooftop sign. "These signs are disappearing at an alarming rate," Miller said. New Ald. Sophia King (4th) also endorsed landmark status for the 1961 hotel in a letter to the commission. Commission staff applauded the design of architects A. Epstein and Sons as an example of the International School, deeply influenced by the work of Mies van der Rohe. Staffers said it was worthy of landmark status as a "critical part of the city's heritage," as well as being "important architecture" and the work of an "important architect." Commissioners also showed no qualms about potentially extending landmark status to buildings in the Michigan Avenue district dating from 1930-1972. Lisa DiChiera of Landmarks Illinois cheered the adoption of the "context study" concept as "a very effective planning tool" for the commission in the future. The Essex now moves through a series of additional commission reports and procedures over the next several months on the way to heading to the City Council for final landmark approval.